Summer is finally here, and that means you’re probably going to be spending a lot more time outside. The wood of your outside deck or patio may need some attention after a long winter exposed to the elements. An ill-maintained deck not only look bad; it can also have many negative consequences, including lowering your property value. Here are just a few of the benefits of having your deck repainted for the summer. Painting your deck or patio is one of the best ways to prevent any accidents from occurring on your property this summer. Wood decks that are unpainted and untreated can lead to splinters and tripping hazards. 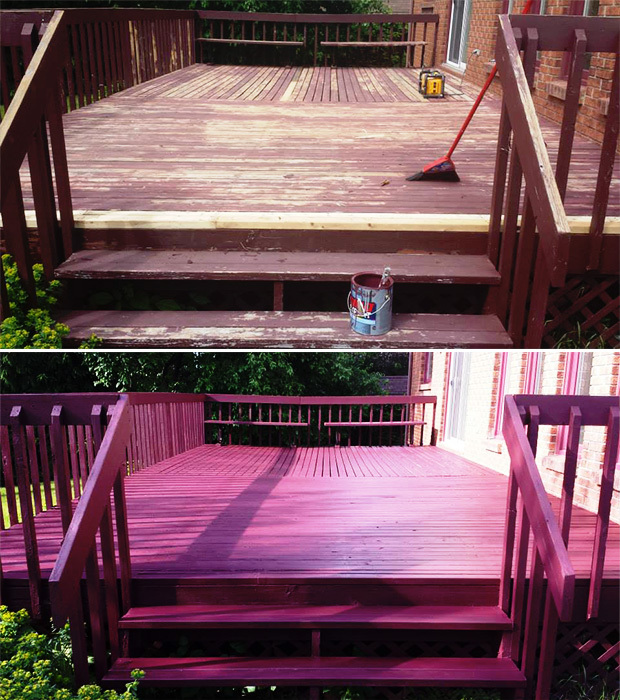 A coat of paint will smooth out the surface of your deck to avoid any painful splinters or unnecessary falls. Having your wood deck oil-primed will prevent decay, so you can rest assured that your deck won’t sink or break under pressure. Painting your deck is a great safety precaution, especially if you have children you want to be able to enjoy the backyard without fear of injury. Having your wood patio painted and oil-primed can also help you save on repairs. A coat of paint seals wood, which prevents bug infestations and rot. A coat of oil primer on your deck also protects against deterioration, giving your deck a longer life. These simple procedures will save you a lot of time and money. Ottawa Gatineau Painting will power wash your deck as well, which eliminates the built-up dirt and grime that can damage your deck over time. Improve the quality of your deck and stop the constant repairs with professional painting. It’s important that you have your deck oil primed and painted by professionals. If these services aren’t done properly, they could lead to safety concerns and property damage. If you’re thinking of having your deck, patio or porch repainted this summer, contact us at Ottawa Gatineau Painting and we’ll provide you with fast, efficient and professional painting services.